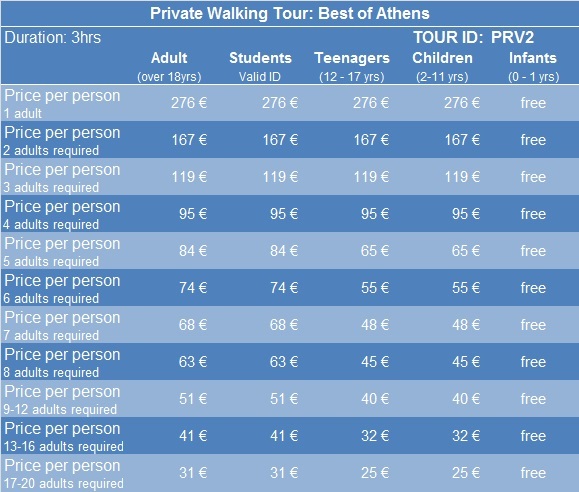 Meet with your expert licensed private guide in the heart of Athens, Syntagma square. Follow your knowledgeable guide to the elegant House of Parliament and the Tomb of the Unknown Soldier. Walk through the cool and shady National Gardens and enjoy the tranquillity and the fresh air. Watch and capture with your camera the Change of Guards done by our famous Evzones in front of the Presidential Residence, which is located on the ultra chic Herodes Atticus Road. Your walk will continue to the Panathenaic Stadium, where you will learn about the first Olympic Games of modern times. Next stop on our itinerary is the Temple of Zeus and Hadrian's Arch, both significant Roman monuments and the beautiful neoclassical Zappeion Hall. The walk continues onwards to the small alleys of the most picturesque area of Athens, the Plaka. Marvel the beautiful St. Catherine’s church and learn about Lysicrates Monument and its’ importance in the 4th Century BC. Pass by Melina's Cafe, a charming little cafe which is dedicated to Greece's most beloved actress and champion, who fought for the return of the Parthenon Marbles. The beautiful alleys of Plaka, will lead you to the Metropolis Square and the Metropolis Cathedral of Athens and on, to the Hadrian's library, the Roman Forum and the colorful, vibrant Flea Market in the Monastiraki area. There will be short stops for commentary and pictures. Confirmation will be received at time of booking, unless booked within 2 days of travel. In this case confirmation will be received within 48 hours, subject to availability. During winter (November 1 to March 31) the latest starting time for tours will be 12:30 pm due to earlier closing hours of the archaeological sites and museums. You can present either a printed paper or an electronic voucher for this. Reduced prices will apply; for more information on discounts and Entrance Fees to the Archaeological Sites and Museums please click here. We usually buy the tickets for you in advance, in order not to line up. Please make sure that you have enough cash (euros) with you to purchase the tickets.